Watching two separate species interact and become friends is an incredible opportunity that many pet owners have the chance to observe from within their own home. 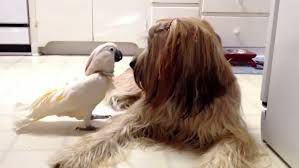 But perhaps no story is quite as intriguing as the relationship between Chou Chou and her friend, a cockatoo named Brandy, simply because of the way they communicate. Chou Chou is an even-tempered dog who nonetheless is a bit curious about the large white bird strutting around the house. She is not sure what to make of Brandy at first. 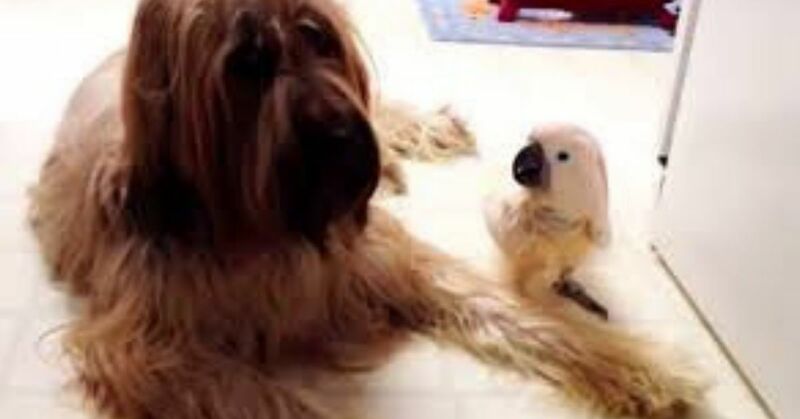 The bird hops around and up to the dog, who calmly and patiently watches every hop the bird makes. Then Brandy decides to speak to her canine friend. At first, the only sounds the bird makes are chattering, repetitive sounds. Chou Chou perks up at the odd noise but quickly puts her hand back down again. Apparently, Brandy was not getting the response she wanted from Chou Chou. She switches gears next by making a sound so realistic, you have to go back and watch the video again to be sure it's true: Brandy barks! Her sounds mimic the sound of Chou Chou barking; not only does this communication pique Chou Chou's interest, but it allows the two animals to begin to "talk" together and get to know each other. Interspecies relationships can be very successful, especially when both parties speak, or bark or chirp their way to loving bonds, lasting friendships, and respect for each other's space. 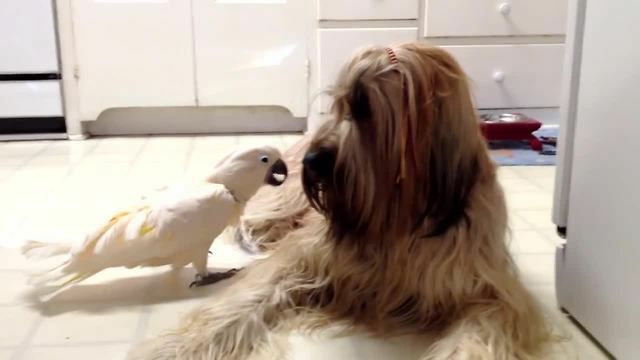 Watch the video below of a bird and her dog and wonder what will become a strongly developed partnership as the years pass by.